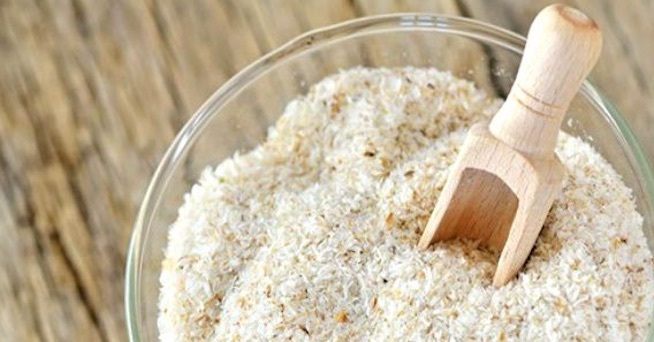 One of my favorite dietitian tricks is to add a tablespoon of psyllium to my a.m. smoothies or oatmeal to keep me fuller longer and crush my cravings for hours. I recently told a friend about the health benefits of adding psyllium fiber to her diet (she wanted to lower her cholesterol levels) and she began by adding a tablespoon of psyllium to her workout smoothies. What happened next? She lost six pounds in two-and-a-half weeks. While she hasn’t had her cholesterol levels re-checked yet, but I’m confident that the psyllium soluble fiber has probably had a positive effect on her blood cholesterol too. Psyllium fiber comes from a shrub plant and is used generally as a soluble fiber in over-the-counter laxatives like Metamucil. If is sold in natural foods stores like Whole Foods as psyllium husk. It has no flavor or odor but adds viscosity to whatever you add it to. For example, if you add it to OJ, it will turn into nectar-thick liquid within minutes. I find it’s best added to protein smoothies or oatmeal. Reams of research show that the soluble fiber helps lower cholesterol, improves GI motility and can help those who suffer from IBS. It also helps stabilize blood sugar, so you’ll have fewer cravings. What’s more, because it expands in your stomach and slows down digestion, you’ll feel fuller longer. I use and recommend starting with 1 tablespoon per day, taken with a beverage or food. A tablespoon adds 15 calories and 5 grams of fiber (almost all of which I soluble fiber). Once your GI tract has adapted to the additional fiber, you can add another tablespoon to get 10 grams of fiber. However, like all types of natural fiber, it may interfere with the absorption of some medications, so if you take prescriptions meds, be sure to check to see if there are any contraindications by taking psyllium when on a specific Rx medication. For example, psyllium may make reduce the effectiveness of tricyclic antidepressants and increase the effectiveness of some diabetes meds.